Fiamma Sidewall Panel Blocker F45 F65 Convenient side panel with a large full light Crystal window and vinyl extension to the floor. Made of rot-proof vinyl, washable fabric with UV protection. Simple to install using the telescopic rafter, elastic hooks and pegs provided. 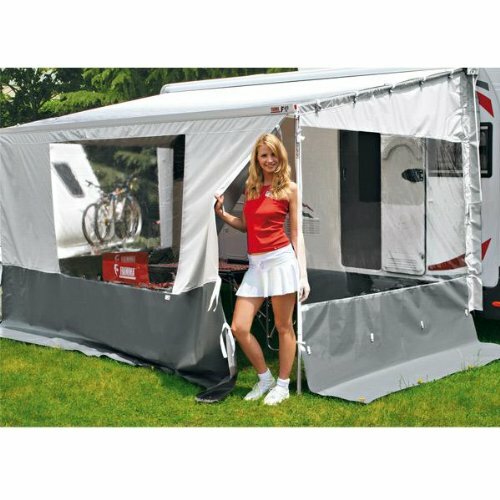 Suitable for Fiamma awnings from 3.00m long and for F65 / F65 S (from 3.20m long), Omnistor 5002/5003/4"900 and Tristor/ Tristor awnings too with optional kit side. 225cm - 280cm(H).